Equality in the workplace is on the rise, but it can come at a cost with women in the corporate world feeling like they need to play a role to be seen as worthy. International Image Consultant Alba Gomez said too often women think they need to wear a dark power suit and white shirt to be taken seriously by their male colleagues, but it can do the opposite and make them disappear into the crowd. "What to wear and how to act at work can be a source of inner conflict – women feel If they act in a powerful, intimidating way they'll get ahead, whereas if they show any female vulnerability they'll be labelled a pushover," Ms Gomez said. "But it couldn't be further from the truth femininity is a very powerful tool, it's all about getting the balance right," she said. "60 percent comes from a positive mindset, 20 percent is how you dress, and 20 percent is your presence and body language." "For more than 14 years worked I worked in a male dominated world as an engineer and one of my first roles here in Australia was in Japanese company, in their culture women are traditionally seen as secretaries or in less powerful positions." "But I always believed I was as good, if not better than my male colleagues and I rose to a position of power – they actually even created a new job for me." "I present in very feminine way with my make-up, hair and accessories, but I knew how to create credibility without compromising." "Rather than think I wasn't good enough, I used my difference of being a woman in man's world to my advantage." "It's not about dressing provocatively or being flirty but using your feminine power to convey your strengths." "Black suits are boring, you need understand your best colours and go for medium shades, chose outfits that are structured, but spice it up with make-up and wear a closed or peep-toe heel. "Stand out and be visible to opportunities and take on extra projects and responsibilities instead of just thinking it's a man's world." Change your mindset; stop feeling less than men who are in a similar position, you are as good, so start seeing yourself as the leader you are. Learn how to dress to convey credibility; Find the colours that work for you, avoid a black suit, that will just make you disappear into the crowd. Choose medium tones and aim for balance in your outfit so if you wear ruffles, pair it with a structured jacket. Think about your body language; this is one of the most powerful tools to change how you are perceived, it can be simple adjustments to the tone of your voice, your posture, making more eye contact or how much you smile. Make an effort with your make-up; Studies show women who apply make-up earn more money and are seen as more professional and credible. "You don't need to dress like a man to get ahead, change your mindset, think about your body language and pay attention to your image and you'll not only be happier, but you'll also be more successful." Colombian born Alba Gomez is an international image consultant and personal brand coach who helps women find their individual style, giving them confidence to take on the world. She is passionate about working with women to transform their lives from the inside out. 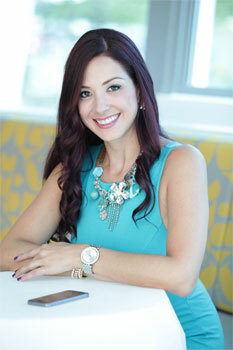 She brings a Latin cultural flair to her business – in Colombia everyone loves to look and feel their best. Alba transformed herself from an unhappy teenager who was bullied for wearing braces and thick glasses to become successful in her career, spending 14 years as an engineer before embarking on her passion for helping women feel good about how they look in her adopted country Australia. She is the author of Transform Your Style in 21 days and 7 Ways to WOW with your first impression. Alba regularly travels the world for speaking, mentoring and coaching engagements and has been nominated for Telstra Business Woman of the Year and has won a Nifnex Influential 100 Award.